100+ mehandi design images to pin if you’re attending a wedding or getting married in 2019! Be it Karwa Chauth, weddings or any other festival of joy, no happy occasion in India is complete without applying henna on your hands. And if you are looking for the perfect mehandi design to adorn your palms for any occasion, then you must check out these 100+ mehandi design photos that I have put together for you to save and share with your girls! Right from Arabic mehandi design to full hand mehandi design, you will find all styles of Indian mehandi design photos right here! So, scroll down and pin all these new mehandi designs to show your mehandi artist for inspiration! An intricate mehandi design with quotes and figures is perfect for the bride-to-be! Brides who want a clutter-free mehandi design with figures can opt for this Radha Krishna mehandi that’s minimal yet beautiful. If you are not the one to go for couple portraits on a full hand mehandi design, then this floral fiesta is a stunning option for you! You can even give this new mehandi design a try, which has beautiful Indian motifs like paisley, leaves and flowers. If fine jali work kind of mehandi design is what you want to get for your wedding day, then save this indian mehandi design photo as an inspiration to show your mehandi artist. How about a beautiful foliage of floral mehandi design with classic circle design on palms? Channel your inner Disney princess by customising your mehandi design with your favourite Disney couple. Or relive your proposal day through your full hand mehandi design. You can even pick a famous monument of your city to depict your love story just like this bride has used Taj Mahal and Laxmi Vilas. If you are a bride who wants to go all out, then make use of figurines along with intricate Indian mehandi design for a stunning bridal mehandi. Or you could even opt for a full hand mehandi design with pretty Indian motifs. You can even opt for a mix of Arabic and Indian mehandi design along with a proposal theme to convey your love story! If you would like to have wedding ceremony portraits, then this sindoor ceremony or varmala is something you can get done on your mehandi design. Or a simple bridal mehandi design like this also looks wonderful if you aren’t too picky on the motifs and patterns. You can even opt for a full hand mehandi design, which has lotus and peacock motifs that are intricate. Leaves, roses and vines are always a classic when it comes to Indian mehandi designs. If you want to go for a cute mehandi design, you can choose some adorable figures and couple silhouettes like this! This simple mehandi design with circles on the palm and floral pattern all over is a gorgeous full hand mehandi design that both the bride or the bride tribe can choose to get. Easily one of the best Indian mehandi design photos, this one should top your ‘to-save’ list if you want a mehandi design that’s crisp, clean and beautifully intricate at once! You can check out more unique bridal mehandi design photos here. If you are not a fan of intricate Indian mehandi designs, then Arabic mehandi designs are a great choice to opt for your big day. Since Arabic mehandi designs occupy less space on your hands and are easier to draw, they can also be made for other festive occasions too! Scroll down to see some amazing Arabic mehandi design photos that you would want to pin immediately. A full hand mehndi design of Arabic style is a fabulous option to wear on your wedding day, especially if Indian mehandi designs are not your style! If you want to keep your mehandi design minimal, you can even try something like this. Bridesmaids, take a cue from this mehandi design photo to finalise your design for an upcoming wedding. You can even try a simple floral band of Arabic mehandi design if you wish to keep the design neat and minimalistic. If a floral mehandi design is not your style, you can give a peacock motif like this a try too! You can even opt for a lace pattern Arabic mehandi design with floral motifs to give your mehandi a modern touch. If a dense mehandi design is what you’re looking at, then this Arabic mehandi design image is a must save! You can also mix the intricacy of Indian mehandi design with the boldness of Arabic mehandi design to create an indo-western fusion style like this Indian mehandi design photo right here! Or perhaps a simple Arabic style mehandi design that’s perfect for festivities like Eid or Karwa Chauth! This Arabic mehandi design is a floral extravaganza at the best! If you are a flower lover like me, then this mehandi design is perfect for you! If you are a to-be-bride who loves Arabic mehandi patterns and are looking for a full hand mehandi design, then these mehandi design images are something you can definitely use to show your mehandi artist! Simple Arabic mehandi designs like these are a good choice for events like engagement or roka! If you love freely drawn mehandi designs, the try something like this simple floral vine a try for your bestie’s engagement or wedding! Peacock motifs are a classic in all kinds of mehandi designs! This Arabic style mehandi with floral and peacock motifs is something to definitely consider getting for your wedding! This netted beauty with floral motifs is a delight to the eyes, ain’t it? Yet another perfect mehandi design for festivals like Eid or Diwali! This new mehandi design with modern and intricate motifs is sure to be a hit among brides who would love to get a hatke henna design for their big day! Here are a few more gorgeous Arabic mehandi design photos for you to check out! If you are looking out for the latest mehandi designs to wear for an upcoming festive event, then check out these mehandi design photos listed below to save or pin to your inspiration boards on Pinterest. This new mehandi design with city skylines of both the bride and the groom’s hometown is a refreshing change in the sea of regular Indian motifs. The neatness and crisp design of these new mehandi designs just make me go WOW! It’s a fine example of how simple patterns can be turned into a beautiful mehandi! This full hand mehandi design is nothing less of an intricate wonder for brides to consider for their big day. How cute is this new mehandi design with the couple’s portrait of their first date?! And the dancing figures on the forearm is just the icing on the cake! A minimalistic new mehandi design like this one is a great choice for your engagement. For brides who love intricate Indian mehendi designs a bit too much, these full legs, full hands mehandi designs are something to definitely show your mehendi artist for inspiration. How cool is this new mehandi design that clearly says how the bride has been ‘bowled over’ by her hubby-to-be! If you wish to incorporate portraits of gods and goddesses in your bridal henna, then these new mehandi designs with beautiful god portraits are something you should definitely save for reference! Simple new mehandi designs like these are a great design for bridesmaids to take inspiration from! Why just write your hubby’s name in your bridal mehandi? Write your name too! This cool new mehandi design with Taj Mahal motifs and both the couple’s name is something to save for your big day! Glitter is the ultimate new mehandi design of 2018! If you are experimental enough, give this trend a try for your big day! White mehandi is another new mehandi design that seems to be catching popularity in the wedding scene. The bride tribe or even the bride can try something like this for an engagement or roka, if not for the main wedding day! 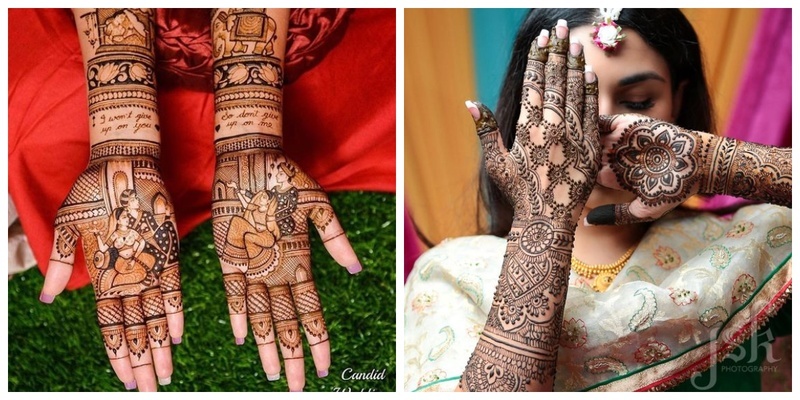 So, ladies, which of these mehandi design photos got saved to your phone or Pinterest board? Let me know in the comments below!